Rustic-style fountains made with old faucets, metal buckets and watering cans add country charm to your landscape. You can make a simple fountain out of a watering can and a galvanized bucket to use as a focal point in your garden. 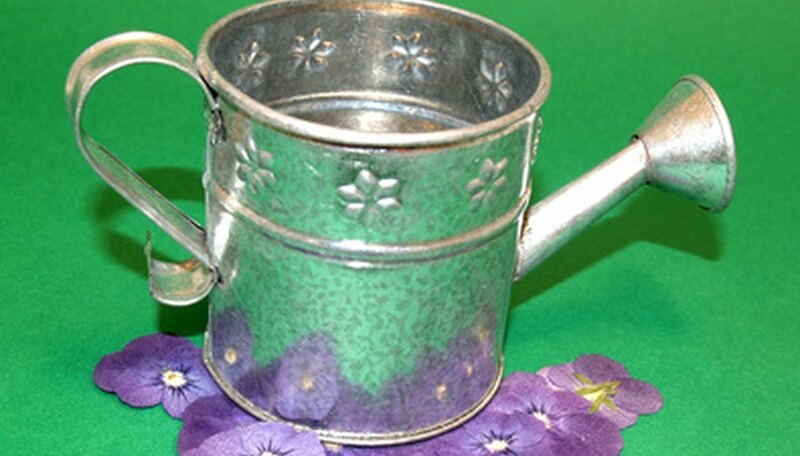 Look for metal watering cans and buckets at thrift or home improvement stores. Fountain pumps are available at most garden supply stores, aquarium supply stores and from online retailers. Use a solar fountain pump and save the electricity. Fill the watering can and the galvanized bucket with water and check for leaks. Pour out the water and seal any leaks with silicone sealant. Allow the sealant to dry. Cut a 5-foot length of copper tubing. Measure 12 inches from one end and make a mark. Measure the height of the galvanized bucket. Measure and mark the copper tubing from the 12-inch mark a distance equal to the height of the bucket. Drill a 3/4-inch hole halfway through the copper tubing and 1 inch above the second mark. Make sure that you only drill through one side of the tubing. Make an inverted "U" in the opposite end of the copper tubing. Copper tubing is soft and will bend easily. The tip of the inverted "U" should be on the same side of the tubing as the drilled hole. Squeeze the tubing in the center of the inverted "U" gently with pliers. The goal is to create an indentation, not to close the tubing. Insert the straight end of the copper tubing 12 inches into the ground where you plan to place the fountain. Situate the galvanized bucket beside the copper tubing, next to the drilled hole. The bucket is the reservoir for the fountain and will catch the water from the spout of the watering can. Place the submersible fountain pump inside the bucket. Cut a length of plastic tubing to fit from the pump to the top of the straight section of the copper tubing. Insert the plastic tubing inside the hole in the copper tubing and feed it up to the top. Attach the opposite end of the plastic tube to the spout on the fountain pump. Hang the watering can handle over the indentation on the inverted "U" section of the copper tubing. Focus the tip of the inverted "U" to flow inside the watering can. If the handle on the can is too short, hang the handle from the tubing with an S hook and a short length of small chain. Run the electrical cord from the fountain to the outlet. If you chose a solar fountain pump, run the solar cord to the solar panel according to the manufacturer’s directions. Fill the bucket with water. Turn on the pump. Move the bucket as needed to catch the water as it spills from the watering can spout.